To comply with the prohibitions on Shabbos, many appliance manufacturers have introduced the “Shabbos Mode” which bypasses some of the electric features on appliances such as lights, door switches and a few other functions. Yet, the Shabbos Mode fails to address concerns with many other electric functions that are equally problematic, or addresses the issues that is not acceptable to all rabbinic opinions. The “Shabbos Keeper” covers all of the primary electric functions that are in operation today and at the same time went so far as to cover even older concerns like the compressor. This was all accomplished without any surreptitious methods, making the “Shabbos Keeper” the most advanced and most compliant with Jewish law. Manufactured by GE Appliances, the Shabbos Keeper enables the Sabbath observer to fully comply with the laws of keeping the Shabbos. Using Enhanced Shabbos Mode (EHM) the Shabbos Keeper automatically sets the refrigerator to Shabbos Mode each week and sets back to weekday mode after Shabbos (and Yom Tov). 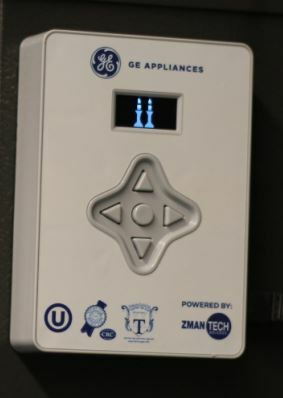 One of its key features is the automatic setting that is part of the revolutionary technology developed by Zman Technologies (Clifton, NJ). “Zman” means time, a reflection of the technology that utilizes location to determine the time of sunset (or onset and conclusion of the Shabbos) without the common practice of switching on the Shabbos mode weekly. Zman is commonly used as a term denoting the start or conclusion of Shabbos or a Jewish holiday. Compatible with over one hundred GE French Door refrigerator models. 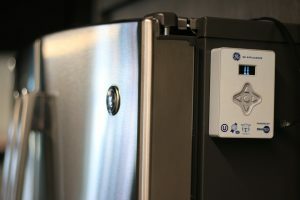 Click here for a full list of compatible GE refrigerators. The Shabbos Keeper completely protects from chilul Shabbos (desecration of the Sabbath) when using the refrigerator. Even the old compressor issues have been addressed. The Shabbos Keeper is, in essence, a mini-computer that automatically assumes the electronic functions of the refrigerator on Shabbos and Yom Tov irrelevant of whether the refrigerator is opened or not. It takes over all of the basic functions of controlling temperature, readouts, and the operation of the compressor. It even leaves the light on for the entire Shabbos or Yom Tov. In essence, there is no longer a “cause and effect” when a refrigerator is opened! The automation feature means that once the location is inserted, the refrigerator will automatically revert to the Shabbos Keeper for the duration of the Shabbos or Yom Tov and then revert back to regular mode for the rest of the week. It is preset until the year 2050!